Adopt this mantra: "This is not the end, but a new beginning"
Bankruptcy is not only financially devastating, but there are psychological effects to losing nearly everything. You may experience feelings of loss, shame, and anger as a result of filing for bankruptcy, but it's important to remember that this is only a temporary situation. It's also helpful if you look at it as a solution. This solution may have been a last-ditch effort — and it probably cost you much of what you've worked for thus far — but it's a solution nonetheless. This is not the end. Rather, it's a new beginning, and you'll get your life back on track faster if you get yourself in that mindset. Once your bankruptcy paperwork is filed and the proverbial wheels are in motion, it's your duty to double-check that all the I's have been dotted and T's crossed so you can start rebuilding your life. One of those starting points is making sure your credit report accurately reflects your bankruptcy status. Personal finance and banking expert Alex Gerard, founder of CardsMix, suggests requesting the annual free copy of your credit report from AnnualCreditReport.com and cross-referencing your information from all three major credit bureaus — Equifax, Experian, and TransUnion — to ensure that everything is up to date and reported exactly the same. "Check that all the accounts that were included in a bankruptcy are noted as having zero balance and are not in default/derogatory status," he says. "For every account that is not correct on your credit report, file a dispute with all three credit agencies." The discrepancy — if there is one — may take some time to resolve, but it's necessary to do your due diligence so a technical error doesn't continue damaging your credit. A big part of the transition from bankruptcy to getting back on your feet is recognizing where you went wrong and accepting responsibility for what was in your control. Think of this stage as a self-induced rehabilitation program. The hardest part is admitting you had a problem and pinpointing where you went wrong, so you don't make the same mistakes again. It's also wise, if your spending was out of control, to identify your spending triggers so you can avoid those in the future and increase your chance of success. What's done is done — you can't change the past. You are, however, in complete control of the future. Make amends with what went wrong that led to your bankruptcy and put those issues to bed; no reason to beat yourself up over it now. Instead, focus on the future and commit to changing those habits that put you in this predicament. Getting a new credit card after you've just filed for bankruptcy might seem counterintuitive to rebuilding your financial foundation, but, in fact, you've probably never needed a credit card more than right now. Usually, options are limited to secured credit cards which require a security deposit, but there is an overlooked option to get a retail store card since many store cards are, in fact, bankruptcy-friendly. Their high APRs, low credit limits, and for store-use only limitations allow them to approve those with lower credit scores. Use this card to pay for expenses that you can turn around and pay back in full every month. The habit of paying in full and on time will gradually start to rebuild your credit. A credit builder loan, sometimes also called a "fresh start" loan, can be another smart way to boost your credit score after a bankruptcy. These small loans, usually offered by credit unions and community banks, approve borrowers' applications even if they have no or poor credit and can be for as little as $100. Often, the lender will deposit the loan amount into a locked savings account that can only be accessed by the borrower when the loan is repaid in full — which, in turn, protects both parties. If you pay the loan as agreed, a good report is sent to the credit bureaus. Now it's time for some truth telling: If you've filed for bankruptcy, you're broke, and your lifestyle should reflect that. I'm not suggesting you live in a box under a bridge, but you will need to reevaluate your expenses and find ways to reduce your overall cost of living so you can start rebuilding your savings, emergency and retirement funds, and whatever other financial resources you've recently depleted. Taking the time to restructure your budget while simultaneously cutting the fat from it is a positive step forward, but there are many other ways to start living on less. As I said in the beginning of this article, bankruptcy isn't the end. 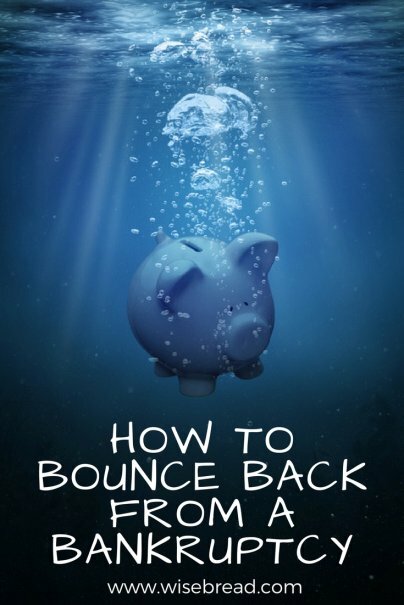 Millions of people have bounced back from bankruptcy to great success, and so can you. Dedicate yourself to becoming a success story instead of a victim of your own undoing and the rebuilding process won't be as arduous as it may seem. This is your life, after all — your one and only, for that matter — and you owe it to yourself and your family (if you have one) to be financially stable while practicing good money habits so you can live a happy life. You're worth at least that much.